Hourglass drum - Site de soundsofangkor ! In organology, the term "hourglass-shaped variable tension drum" refers to a drum whose musician can modify the tension of the membrane or membranes by means of a mechanical process and, consequently, the height of the notes in order to make a melody-rhythmic instrument. Variable tension drums exist in Asia and sub-Saharan Africa. These are two-membrane instruments. The most common principle consists of a lacing system passing alternately through the edges of each membrane. Thus, by pressing the ties with more or less force, the musician varies the tension of the skins and consequently the pitch of the sound. The hourglass drums appear for the first time in the 7th century in the iconography. 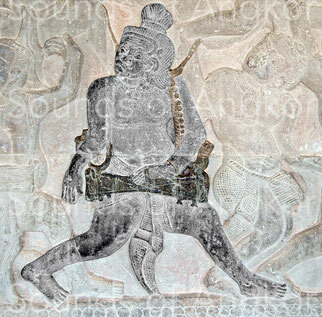 In the Angkorian period, they are visible on many bas-reliefs at Angkor Wat, Banteay Chhmar and Bayon. In this last temple, they are seen indifferently in the hands of the Khmer or the Cham. The Angkorian representations are diversified. Some show clearly the shape of an hourglass more or less elongated, others only a cylinder, representing the tension strings rather than the barrel. The sign of the typology of this drum is the playing position with the hands offset: the right one strikes while the left compresses the links allowing to vary the tension. Diverse carrying devices also indicate the nature of this instrument: it can be a simple shoulder strap, a bare arch or ornamented with one or two rows of bells. At Angkor Wat, the ends of some arches terminate in heads of nāga snakes. Some of them also show two elegant curved lines facing each other from the head of the tambourine. These two curved lines represent the tail of the nāga and the support their body. In reality, these tails were perhaps made of buffalo horn in the image of those of the rice sickles. 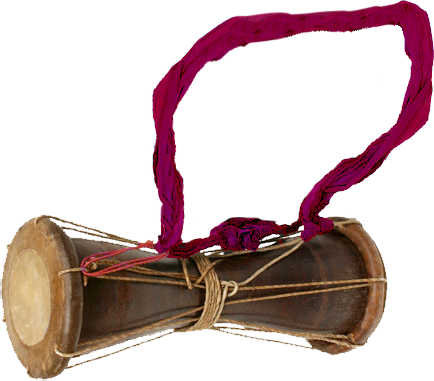 Hourglass drum with its hoop and a pair of nāga. Angkor Wat, Historical Parade. The Angkorian instruments are similar to the contemporary timila (or thimila) of South India. Timila or thimila. South India. At each end of the drum, there is sometimes a rim larger than the central part. It is the ring around which is tightened the membrane, point of passage of the links. 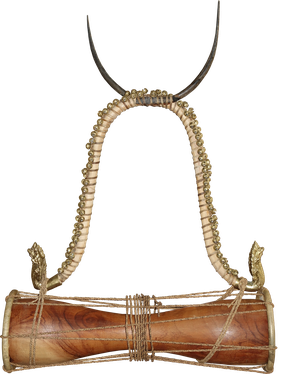 Some drums reveal, in the middle of the drum, a band constituted by the winding of the surplus length of the link connecting the two membranes allowing the musician to repair, if necessary, the ligature. 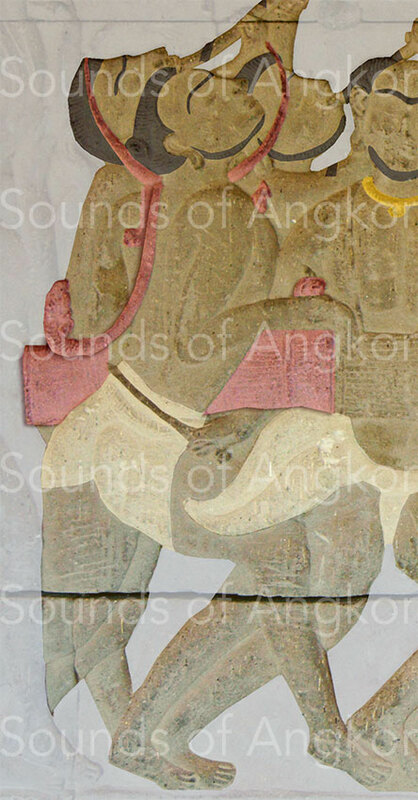 At the Angkorian period, drums are usually carried on the shoulder, sometimes as a shoulder strap or around the neck as shown in the north gallery of Angkor Wat. Cham drummer. We see clearly the shape of the hourglass and the excess of ligature wound at the center. Bayon. Cham drummer. 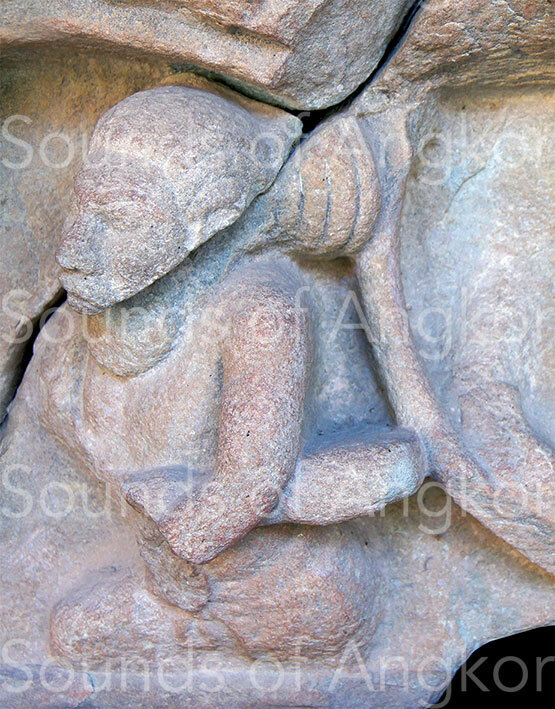 This relief shows a tying similar to that of the Indian thimila. Bayon. On this rare representation of an hourglass drum at Banteay Chhmar, we see an instrument of unusual length. We don't distinguish a carrying hoop but two square pieces under the instrument. It could be a device for adjusting the length of the strap. One sees clearly the left hand resting in the center of the barrel and the right hand striking the skin. If the chronological logic prevails in the other chapters, we preferred to analyze the Angkorian hourglass drums beforehand to discover that the iconography of the 7th century provided us with such instruments, which is not obvious at first glance. 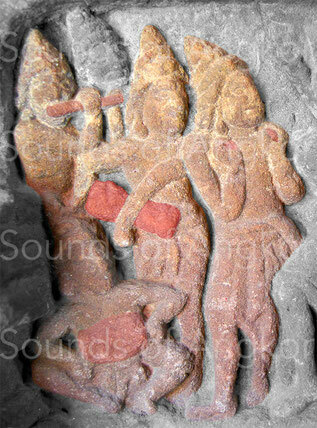 Looking at the lintel of Wat Ang Khna, we discover in the middle, a drummer holding his instrument in an unusual way. With his right hand he strikes a membrane while his left arm presses the tension ties. Careful observation even reveals ends more prominent than the center of the instrument. 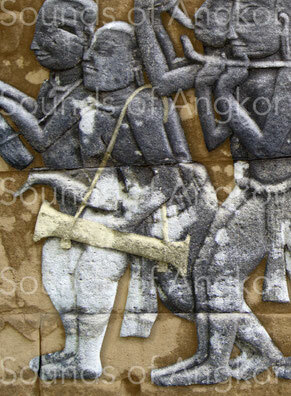 A second pre-Angkorian lintel shows a musician holding a broken instrument under his left arm. His right arm disappeared. The cylinder presents a depression under the musician's arm. 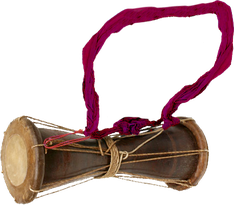 Thus, in light of the lintel of Wat Ang Khna, it is possible to affirm that this is also a hourglass-shaped variable tension drum. Hourglass drum. 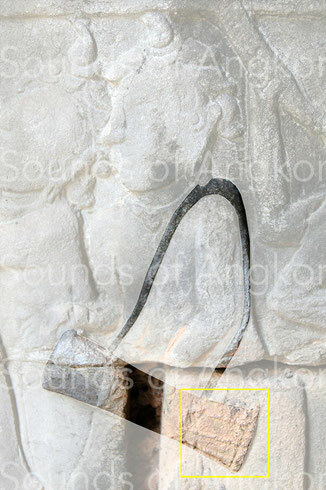 Detail of a lintel of Sambor Prei Kuk. 7th c. National Museum of Cambodia. The drums depicted on the bas-reliefs of the north gallery of Angkor Wat have differentiated and even fanciful shapes and tension devices. Sometimes no links appears, the center of the drum has a bulge rather than a vacuum. Only one of them clearly shows an hourglass shape hanging from two large hooks. The opposite representation shows some interesting details: the arch with its row of bells, a hook, on the left, secured to the arch, several ligatures of the tension cords including the central one under which the left hand passes, tails of nāga which we Inform that tips without details are snake heads.